I’ll never forget watching the film The Omen for the first time – I don’t know which was scarier, little Damien or the Nanny character played by the brilliant Billie Whitelaw. One thing I can confirm to be scarier than either has been some of the wiring and other items I have been tackling on Keith’s Rover 3500. It’s been a horrible week but, finally, I’m getting somewhere and it’s very close to being the car it deserves to be. Recent events had almost made me believe me that the car was trying to kill me. 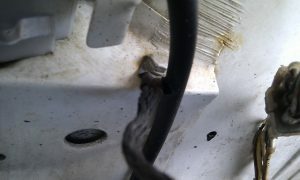 Some badly fitted sound insulation fell onto the driver’s side exhaust manifold causing some interesting smouldering. Then, early one morning this week, I was travelling to my place of work minding my own business when, without warning, smoke started to wisp out from the fusebox cover. You can imagine my concern, driving someone else’s car that’s worth a few quid let alone its sentimental value to then set the damn thing on fire. The problem was the circuit for the sidelights and panel lights. I was initially mortified, as two days earlier, I had replaced blown bulbs in the clock, dashboard and front sidelamp – was it something I had done? Had I ‘upset’ something and, more to the point, could I deal with it? 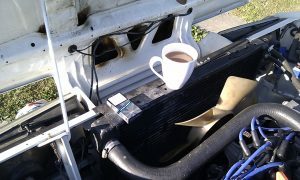 My knowledge of auto electrics revolves around fitting starters, alternators etc., and that’s it. I have no real skill in this area although I do fully understand the principle and theory. Keith keeps reminding me now and again to and I quote ‘enjoy the car’. I would really love to do just that, but I can’t until I’m 100% certain it’s on the money or as best as you can get for 1976. Following all sorts of poking, prodding, disconnecting and wiggling of electrical components, I found the culprit and the fault was nothing short of disgusting. At some point during the fitting of the number plate lamps, the clear lens had snapped where the copper circuit terminal joins. 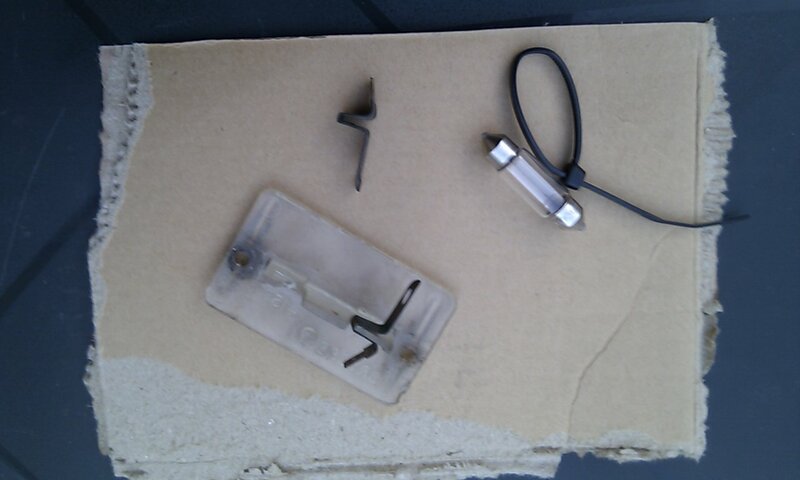 Someone had dealt with this by using a cable tie to hold the connector to the bulb. Over a period of time, the slamming of the boot had caused a live terminal to short out on the tailgate, hence the Indian distress smoke signals. Why, though, didn’t the fuse blow, I wondered. Simple answer: the correct grade of fuse is 15 amps though someone had seen fit to use one of 25 amps – not ideal eh? 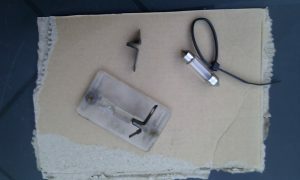 The bloody awful broken plate lights have been repaired using chemical steel and both work fine. 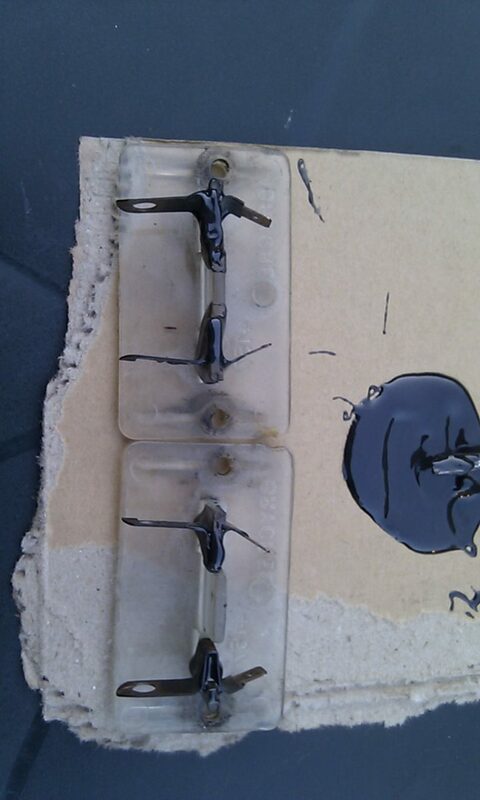 Some minor melting of the fusebox has happened, but not sufficient to warrant a replacement. All the fuses have been checked and, where needed, refitted using the correctly rated fuse. However, this has not been the only electrical issue. Just today, whilst checking continuity, I stumbled upon an issue that quite honestly could have killed myself, Keith or anyone else travelling in the car. In all of the 20+ years of fixing or driving cars, I have NEVER witnessed workmanship as careless or dangerous as what I had to deal with this afternoon. While I was nipping up the slightly loose fan belt, I noticed that the main live feed from the battery to the starter motor had been rubbing on the earth strap, allready chafing away the outer insulation. The picture is slightly blurred but you get the general idea. I’m pleased to report that this cable has been routed well clear of any potential earthing points. Had these two cables eventually been left to rub through and contact each other, the outcome would more than likely have been a rather big bang followed by the driver dialling 999 and requesting the Fire service – and I’m not joking either! A thorough inspection of the under-bonnet wiring ensued and any wiring or routing problems have also been tackled. One the whole, a shocking lack of attention to detail. I’m sure Keith will be making a phone call over these facts – I’m sure I will! Earlier in the week I received a rather large box from Rimmer Bros containing a reconditioned radiator and new viscous hub unit. Taking full advantage of these long summer evenings, I set to work finally laying to rest the weepy radiator and god awful noisy, clunking, squeaking and grinding fan. 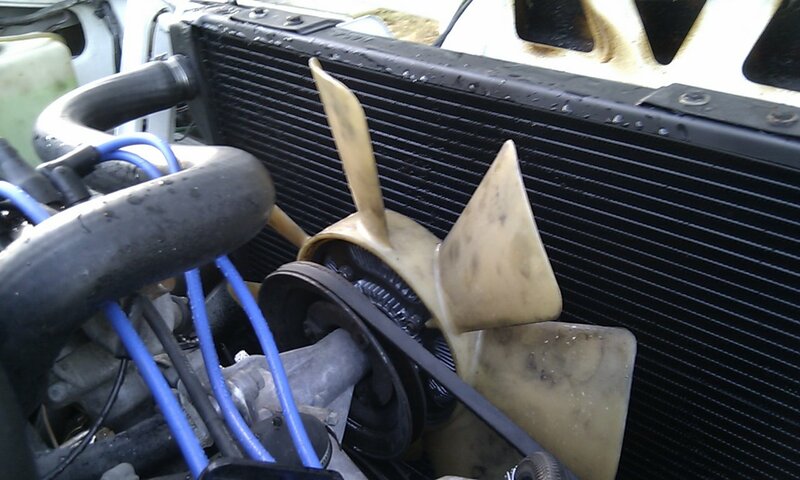 On the whole, it all went without incident apart from the old fan hub being stubborn requiring much heat, hammering and swearing to release itself from the water pump. Follwing an extensive road test, the awful racket has gone and the temp dial shows a healthy looking 85 degrees. Peace and tranquillity at long last! In all, the car can now be driven in confidence without risk of loosing water, overheating or exploding into a thousand parts. It’s been an uphill battle, but it’s sure as hell been worthwhile and most enjoyable!